Indoor soccer, also known as ‘mini football’ in Europe, is exactly what the name suggests. Indoor soccer is played indoors, usually within a dome-like arena. The ‘mini’ term comes in due to the limited space that this modified sport affords. Instead of having out-of-bounds lines, players are walled in. This makes throw-ins virtually impossible, but does afford a more seamless and uninterrupted game of soccer. Originated in North America, indoor soccer is not as internationally recognized as its popular counterpart. However, indoor soccer/ indoor football/ mini football has gained traction in countries where soccer is the sport of choice such as in Mexico and Spain. And while indoor soccer may sound like an amateur sport, it has enough of a following to afford not only amateur players, but collegiate and professional teams as well. One visit to the Major Arena Soccer League website will prove the growing popularity of the sport as professional teams can be found in many major US cities including right here in Houston. Learn more about the sport and then come join us for some Houston indoor soccer at O Athletik! 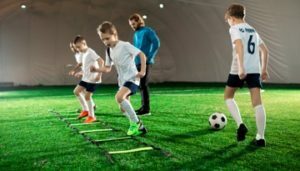 Under examination, it appears that the appeal of a modified sport such as indoor soccer is the amount of control one has over the conditions of the playing field, from lighting and temperature to turf material and arena size. It’s a great option for year-round players who don’t want to wait for the seasons to dictate when to play their favorite sport. The biggest difference between indoor and outdoor soccer is the boundary lines. While an open field will have lines drawn on the grass, an indoor field will have physical walls built up that defines the line. This should make the referee’s job that much easier. However, a referee to an indoor soccer match will no doubt be kept on their toes, as sliding on the turf is not allowed as is the case with a regular field of grass. In addition to the no sliding rule, players are not allowed throw-ins. This comes as an obvious fact considering there are no sidelines present beyond the wall that defines the boundaries of the field. The good news is that your favorite pair of cleats can be worn in an indoor soccer field. However, you can opt to wear a normal pair of rubber-sole shoes since you won’t be playing on a regular field. It is up to the players’ preferences! Indoor soccer has a major pro in that it can be played without having to worry about weather conditions. However, others may find that nothing can beat a classic game of soccer on an open field. We’ve compiled a list of pros and cons to decide for yourself if you would consider giving indoor soccer a shot. 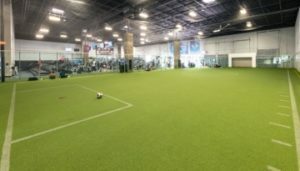 Prepare for the Houston indoor soccer season at O Athletik. With state of the art sports science equipment, you can track your progress and set goals to prepare for the season. For example, our InBody machine allows users to measure and map the details of their body composition down to fat percentage, water percentage and more. Curious about our latest sports science technology? Visit us for more information.